It’s hard to believe that not one of Canada’s 12 astronauts figured out a way to use space shuttle’s Canada Arm to pop open a cool can of beer in space. 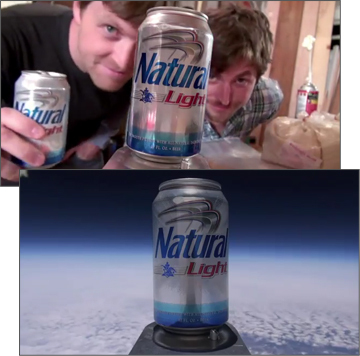 Instead it appears that the title of ‘first beer in space’ goes to Danny and Rich who sent a can of Natural Light into the ‘Nattrosphere’ above rural Missouri. It’s certainly not the first time that someone has sent an object with a camcorder into space attached to a weather balloon. Danny and Rich, inspired by YouTube videos of these projects, and a few cans of ‘Natty Light’ decided that they would be the ones to step up and send the first can of beer into space. They approached the brand with the idea; got the thumbs up, then the planning and preparation began at Mission Control in Danny’s parents’ garage. On May 27th, with clearance and approval from the FAA, the two launched their spacecraft (dubbed the Aluminum Fullcan by one of Natural Light’s Facebook fans). The craft consisted of a styrofoam cooler containing a full can of beer, GPS tracking device, handwarmers (it’s cold in space) and a HD video camera pointed at an externally-mounted ’empty’ can of Natural Light. The spacecraft took nearly 2 hours and ascended to a height of over 90,000 feet before the weather balloon finally popped. It then fell back to earth landing 60 miles from the launch site where Danny and Rich located it using the on-board GPS. The full can of beer escaped unharmed, and Natural Light is looking for suggestions about what to do with it. While I have my suspicions that any actual ginger-haired souls were actually shorn of head hair, eyebrow, “love rug” (dramatic pause) or god forbid, hair from anywhere else to create this hairy orange billboard for Ginger Joe, these ads still send a shudder down my spine at the thought. Ginger Joe beer was first launched in the UK back in March as the little brother brand to Stone’s Ginger Wine. 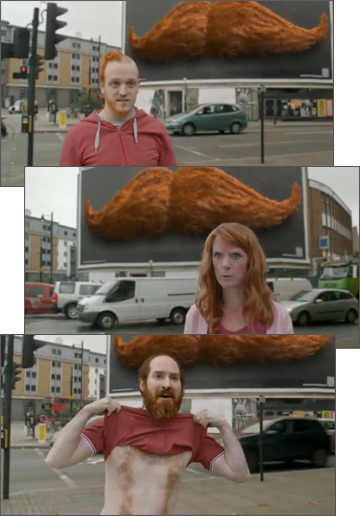 In October, Ginger Joe launched a huge billboard in the Shoreditch area of London that featured the brand’s iconic orange moustache and a QR code that directed users to the Facebook page where they could use the ‘Tache Yourself’ app to add a Ginger Joe moustache to their profile picture. In late October, the message changed to a thank you message for everyone “who donated for the making of our big hairy poster” and an invitation to go to the Facebook page and claim one of 20,000 free bottles of Ginger Joe. 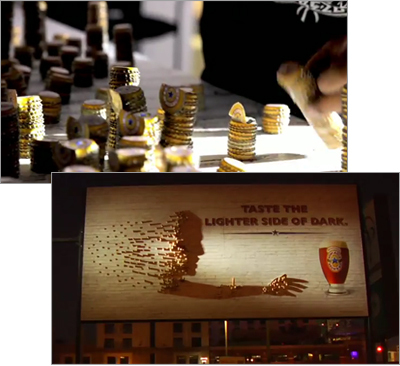 The campaign was created by London agency DHM, the PR handled by Frank. There are a lot worse places to be trapped than in a giant glass of Newcastle Brown Ale, and during opening weekend at San Diego’s Del Mar Race Track, lucky horse racing fans were able to experience just that. OK, well maybe they were not exactly trapped in a glass of beer, but if you viewed things from just the right angle it sure looked like they were. 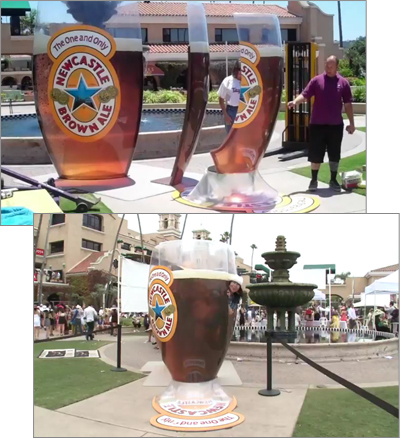 San Diego ad agency Vitro created a unique installation for this Newcastle Brown Ale campaign using three strategically-placed pieces of a life-sized version of a Geordie Schooner to creating the optical illusion. The glass, known now as a Geordie Schooner was originally called a Wellington glass. It became so popular in the city of Newcastle that it became known as the ‘Geordie’, a nickname for the local residents of the northeast British city. People who checked-in using Foursquare at the installation or posted pictures to their social networks received Newcastle Brown Ale tshirts and other merchandise. As you can see in the video above, there were no shortage of people volunteering to pose within the installation. I don’t know about you, but I’m feeling thirsty for some reason. Two New York artists have used over 3000 Newcastle Brown Ale bottle caps to create this great piece of shadow art. The billboard is part of the “The Lighter Side of Dark’ campaign created by ad agency Vitro, and is displayed in the Gaslamp district of San Diego this summer. When seen in the day the small billboard looks like an unusual piece of artwork with random stacks of beer bottle caps nailed to its surface. Once the sun goes down and a spotlight is directed across it’s surface the artwork comes to life. To see more of this type of shadow art check out these examples by Tim Noble and Sue Webster who create their art from strategically constructed piles of garbage. I unfortunately missed this campaign from Budweiser in Ireland when it was first launched in late April. The first you may be asking yourself is, “If I am in Ireland – a land of awesome beers like Guinness, Harp, Murphy’s and Beamish – is a Budweiser Ice Cold draught going to be my beer of choice?” Maybe, if you can save a few Euros or if it’s free you will. This summer Budweiser has launched the Ice Cold Index app offering beer drinkers throughout Ireland special deals based on the temperature. The campaign developed by DDB UK will award drinkers a free pint when the temperature in their area reaches 20°C. If the temperature reaches 18°C or 19°C outdoors the app will offer €2 off the user’s next pint, with €1 off if the temperature reaches 16°C or 17°C. A user checks the app to see what the daily offer is in their region. Temperatures for the current day are taken at noon in four different locations Ulster, Connacht, Leinster and Munster. 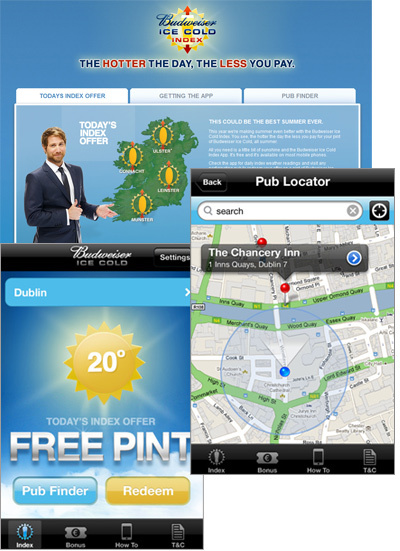 Once the offer is active, the user can use the Pub Finder to locate one of the 2,500 participating venues across Ireland. Beer drinkers are eligible to use the app for one beer purchase per day. But, in a valiant effort to save drinkers from themselves they can access a voucher 4 out of any 7 day period. 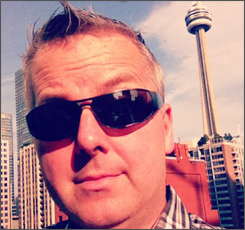 The app is available for iPhone, Android, Blackberry and Nokia. For instructions on other mobile phones, users can text the word ‘INDEX’ to 5040.